Richard Zwirn is a small-scale breeder in New York. While Avalyn Hunter takes a rather hopeful view on whether high-class racemares make the best producers in her piece “From Fame to Foals” (The Blood-Horse of Feb. 12, page 390 ), sad to say, I am a bit more skeptical. 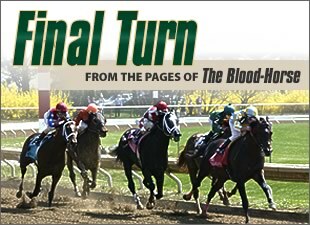 On many late nights over the last 25 years, I have secluded myself for however long I could keep my eyes open to scour the horse racing trades, sales catalogs, race entries/results, industry news, stallion registries, and the like. I have sought to become as knowledgeable as I can about this industry and issues dealing with vet science, genetics, marketplace conditions, statistics, and racing history. Regarding genetics, I have often hypothesized about certain trends in gender, color, track surface preference, birth order, birth dates, dosage, nicks—hoping to find a “key”—but never substantiated beliefs with any reliability or validity. In the accompanying chart is listed some of the female household names of racing who have produced multiple foals. Besides these stars are dozens of fillies and mares we have loved and assumed would be the next “blue hens” upon retirement. However, sadly, none of these megastars have thrown a single American stakes winner. These mares had every right to be “sure things” based upon race record and expert care, along with matings to the best and most expensive stallions in the land. Still, their production has been abysmal. The thousands of fillies they beat on the track probably have had greater success on the farm post-retirement than these heralded stars. What’s wrong with this picture? Is it just God’s way? Did they over-extend or “empty” themselves while on the racetrack? Are there medication remnant issues? Do they possess too many masculine traits? Whatever it is, I believe this is no coincidence. Some old-time breeders and vets I have talked with suggest the untried or lightly raced mares with some class/pedigree have proved most successful. They sense the promise and potential were initially there. Some unfortunate things got in the way, and yet the mare was able to “save” herself for a breeding career. These experts go on to say they believe too much effort and stress at one point deplete an important, difficult-to-pinpoint energy reservoir. I know it sounds very unscientific, but it occurs time and time again. It may be akin to a theory that the racehorses most prone to career-ending injuries during races are those that “stretch” themselves beyond their comfort zones due to their fierce competitive nature. I’m not a great numbers guy. I’m sure the data presented in “From Fame to Foals” and the earlier related piece “Class Action” (The Blood-Horse of Oct. 23, 2010, page 3030) are accurate. But it is not a fair representation. If expectations, costs, and other advantages associated with these racehorses are factored in, top-class mares just are not measuring up. They are not begetting the quality outcomes one would expect from “breeding the best to the best.” And to perpetuate this fallacy is irresponsible. It creates inflation where it should not and has occasionally (and dangerously) put forth rules and regulations to be considered regarding the limitations on bloodstock to be allowed to breed. In addition, the percentage of stakes winners born to non-stakes-winning producers is mighty significant. Hence, the excitement of breeding Thoroughbred racehorses…and the reason small breeders with moderate stock still have a shot. You never know for sure where the good ones will come from. Don’t get me wrong. If I were the Mosses or Jacksons, the owners of female Horses of the Year Zenyatta and Rachel Alexandra, respectively, I wouldn’t trade places with anyone. But for those of you who are just counting the days until the offspring of a Curlin/Rachel Alexandra or Bernardini/Zenyatta mating get to the races, I urge caution. They may not be the second coming of their mothers. Below are listed millionaires, champions, or grade I winners that have produced multiple foals but no American stakes winners.